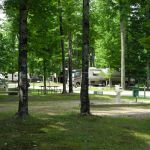 Ask fellow campers about "Mohican North Star RV Park" and nearby attractions. We stayed one night passing through. As others have said, it's a clean, well maintained park. No amenities. There are port a potties only. Sites are close on the back cause you share a hookup pedestal. But plenty of room on the front. The cable didn't work. We couldn't get any over the air channels and couldn't get satellite due to the trees. Gas station out front with enough room our rig to fill up. You have to go to the hotel front desk to register. There is a bus lane there or there is a vacant lot by the RV Park you can park in and walk over to the hotel. Food at the casino is ok. About what you would expect. Hard to beat $30 for a night. Plus they give you 10 in free play for the casino. Plenty of grass to walk the dog. We camped at Mohican North Star RV Park in a Motorhome. This place was perfect for an overnight stop. Nice level pull-thru sites in a wooded area right next door to the casino. There are no amenities and even the bathrooms are just port-a-potties. You can walk the 1 minute walk to the casino for regular bathrooms. Power was fine and the water pressure was really good for a nice shower in the rig. Although there is a cable TV hook-up it does not work. However, I was able to pull in all of the major stations with my OTA antenna. WIFI only inside the casino. One note, if you follow your GPS, you need to turn onto County Rd Q at the big interchange. Both of our GPS units had us turning about a quarter mile past where we should turn. We camped at Mohican North Star RV Park in a Fifth Wheel. Park was good. Next to casino. Stayed one night. Lots of trees so no satellite. Cable not working, though advertised. No wifi at campground. It was OK for a one night stay going through but Gould not recommend for longer stays unless the casino was the reason for the stay. We camped at Mohican North Star RV Park in a Motorhome. Several miles off the highway out in the middle of nowhere, the casino resort is very nice and the RV park was better than we expected. No restrooms, showers, WiFi or cable. We didn't pick up any over the air channels. There are some porta potties. Nice restrooms and free WiFi at casino. Not sure if the casino has showers. Satellite reception is hit or miss depending on your site. Side by side spots. Tight and a little tricky getting into and out of. Barely long enough for big rig and tow. Sites were level and utilities worked fine. No onsite staff or security at RV park. You need to pull off in a big vacant lot and go into casino to register. Roads and sites were mostly dirt. We camped at Mohican North Star RV Park in a Motorhome. This is a very clean and neat park with no amenities other than the casino. No pool showers or bathrooms other than those in the casino. Through there are portapotties strategically located. Clean site, 1/2 pull through with paved roads and gravel sites. Close together side by side but fine in the front yard. We camped at Mohican North Star RV Park in a Motorhome. The bad: No pool, no playground, no showers, no dog walk, no wifi, and no additional facilities at all. The good: A nice clean and well-maintained park with 57 sites half of which are pull through with plenty of space. As the sites are back to back: sharing power poles, water, and sewer hookups, the back yard is adjacent to the RV next door and very small. However, the front yard is spacious with fire pits and tables. Every site is within a short walk of the casino, and the trip back is even easier as you'll be lighter. You will receive a $10 free play card at the casino and an additional $10 if you are a new member in their "club." The cafe and restaurant and cafe are reasonable prices and the food fair. If that will not do for you, bring food as directions to the park are: go to the middle of nowhere, turn left (or right) and continue a goodly distance. There are a convenience store and gas station out front, and the gas pumps have plenty of clearance for a 13 foot high RV. There are porta potties throughout the campground and real bathrooms in the casino if you can make it that far. There is also free wifi in the casino. I also heard rumor of a golf course nearby. I didn't investigate that as I hire kids to put my balls in the hole when I play golf. I don't think that tent camping is allowed. If desired you should call. My wife and I think it's a good value as we never use the pool, volleyball nets, horseshoes, etc. The park is quiet, clean, and pretty with woods for the cat to hunt in. That saves money on cat food. We would not hesitate to stay there again. And, they take reservations though they were not necessary when we were here. We camped at Mohican North Star RV Park in a Motorhome. There is nothing in the area other than the casino with its fair cafe and restaurant and a golf course (I think). If you don't gamble and have trouble entertaining yourself this may not be the place for you. Stayed here a couple of years ago: no changes or improvements in the RV park. Seems not to be a priority with casino management. Sites are side by side and not level (pull through sites) and are either gravel or gravel. No showers, restrooms or WiFi available in thenRV park. On the plus side, this park is very quiet, however a little out of the way. Will stay only when passing through if in the area. We camped at Mohican North Star RV Park in a Motorhome. Very nice campground on the grounds of a casino in the middle of nowhere . Spaces are narrow, and hookups are side-by-side. You get a card pre-loaded with $10 for slots play just for staying there. If you sign up for their Star Card, you get another $10. Both my husband and I signed up, so altogether we got $30 free play. I won $19 on the slots without putting any of my money in. So we got our campsite almost free. I looked at their menus. Their prices are very reasonable, unlike the casinos in Atlantic City. Don't follow Google directions. Follow the signs for the casino. They'll lead you right in there. We camped at Mohican North Star RV Park in a Motorhome. We stayed here while traveling between destinations and to meet some friends here. The casino is off the beaten path and the RV park was obviously just an after thought after building the casino. There is little signage to direct us to the park and when we checked in, the lady at the hotel registration admitted that she knew nothing about the RV area. The lack of customer service is very apparent, with limited amenities and services. On the plus side, it is quiet and the lack of lights back here makes sky gazing very easy. 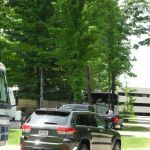 We camped at Mohican North Star RV Park in a Fifth Wheel. The previous 2009 review is still pretty accurate. The campground is wooded with 50A FHUs, no showers or restrooms and a few porta-potties. Sites are dirt/gravel with side-by-side configurations for both back-in and pull through. Big rigs can maneuver with some sites a little tighter getting into than others. We could not get satellite TV and only a couple of over-the-air channels. Our Verizon cell phones and air card worked well on 3G. It’s very quiet at night. Rates are $28/night for Friday & Saturday and $25 for other nights. We camped at Mohican North Star RV Park in a Motorhome. Another small campground next to the Casino. Has easy access and "steppe" sites. We camped at Mohican North Star RV Park in a Fifth Wheel. This is a rustic campground in the tall trees. Roads are paved. Sites are dirt/gravel and fairly level. There is very little grass. Sites have side by side hookups, even the backins which means one RV has to back in and the other has to pull in forward. The campground is big rig friendly. There are no showers or restrooms. We could not get satellite TV from our site. Telephone and air card signals were very weak. The campground is off the beaten path and the only reason for going there is to go to the casino. The casino had a small lunch buffet. The food was very good. We camped at Mohican North Star RV Park in a Motorhome. Shore Services: 50amp, Sewer good, Water @ 50psi - WiFi: None - AT&T Cell Phone: Fair strength 2bars - Sprint Air Card: Weak but acceptable with Freedom Antenna and amplifier - Cable: None - Can pickup Over the air local Digital TV. Site: 11 Gravel with some grass between sites - Site Size: long enough to park TV - Site Closeness: Fairly close. Common location of Shore power putting service side of trailers close together. - Roads: Gravel and dirt. - Restrooms: None Porta Potties - Laundry: None - Long term tenants: None - Directv Satellite: good at our site. Others may have problem. - Discounts: None. Does give $10 comp to use in Casino - Payment: Credit card - Additional Charges: None - Additional Remarks: For a Casino this is not a very nice park. Our site was pretty level both front and sides. This is quite a way off the main roads but road is good getting here. Wal-Mart is in Shawano which is 17 miles away. 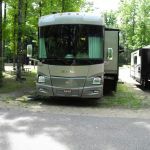 We camped at Mohican North Star RV Park in a Fifth Wheel. Friendly atmosphere. Ten dollar coupon for casino. Good area for pets. Level ground, grass, picnic table, fire pit, and gravel parking area. We camped at Mohican North Star RV Park in a Motorhome. 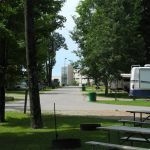 Are you affiliated with Mohican North Star RV Park ?